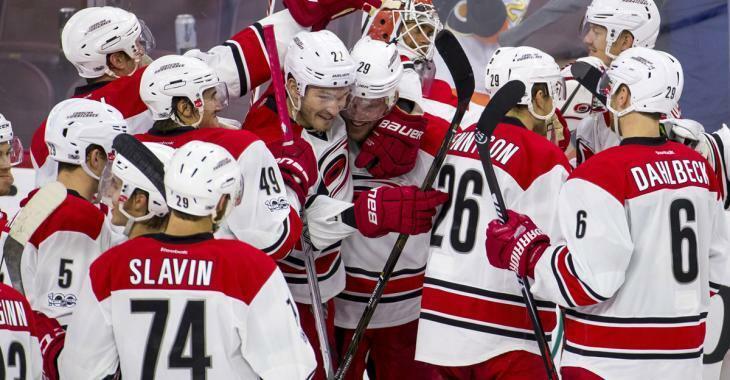 NHL News : Report: Canes owner challenges would-be buyer during sale negotiations! Report: Canes owner challenges would-be buyer during sale negotiations! Threats, relocation, and bidding war... what's going to happen?! Carolina Hurricanes owner Peter Karmanos is willing to make a deal to sale his hockey team, but there seems to be a huge bump in the road. The owner has revealed that he doubts interested buyer Chuck Greenberg has the money to complete the sale. A former co-owner of the Texas Rangers, Greenberg approached Karmanos about purchasing the team after Karmanos made it known he'd be willing to sell the team if the price is right and on the condition it remains in Raleigh. The hefty price tag is said to be around $500 million, and while Greenberg expressed he was greatly interested, negotiations have hit a snag. "The sale of the team is just sitting there, waiting for Chuck to say, 'Geez, I can't raise the money,'" Karmanos told Chip Alexander of The News & Observer. "We have a commitment to Chuck, and we're going to see it through. "And quite frankly I wish he would pick up the phone and say, 'Geez, you know what, I can't get it done.' Because it looks like he can't get it done. ... I'm telling you, he can't raise the money." It looks like Karmanos may be ready to move on and sale the franchise to another buyer if Greenberg can't close the deal. "I have umpteen million people who have figured out Raleigh is a pretty good area, and it's a pretty good team and pretty good market," Karmanos said. "So if Chuck can't deliver and I still want to sell the team, the price keeps going up."